New appraisal tool will give you a free and quick domain name appraisal. 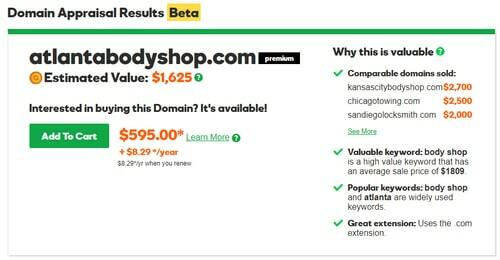 GoDaddy has made its much-improved automated domain name valuation tool available to the public. The basic valuation tool has actually been available for a little while but not publicized. Until today it did not show the comparative sales and valuation rationale that’s now visible on the right site. The comps are pretty good, too. For AtlantaBodyShop.com, GoDaddy used KansasCityBodyShop.com, ChicagoTowing.com and PittsburghGarage.com among others. You can view up to 10 comps. Also, note that the domain name shows up for sale because I have it listed with AfternicDLS. There is currently no bulk valuation tool available to the public. Given GoDaddy’s brand recognition, I could see this tool being valuable when negotiating a sale with someone. For example, if you are buying a domain name and offering more than the valuation, giving a link to the appraisal might sway the seller. Likewise, if you are you selling a domain for less than the appraisal the tool could come in handy. The appraisal tool recently helped me. Prior to the additional data being displayed, a domain seller found the appraisal beta through search. He sent me a valuation for the domain name I wanted to buy. I offered him about 60% of the valuation and he decided it was fair.